The Hurricane Watch Net is active around the clock on 7268 and/or 14325 kHz as Hurricane Michael approaches the US Gulf Coast. Landfall is expected later today (10/10). Please keep these frequencies clear for net operations and do not transmit to the net unless you need assistance or have information to provide from affected areas. The Hurricane Watch Net is looking specifically for the following information: observed ground-truth data from those in the affected area (wind speed, wind gusts, wind direction, barometric pressure; if available, rainfall, damage, and storm surge). Measured weather data is always appreciated but we do accept estimated. For updates and more information, visit <www.hwn.org>. Please note: As the storm makes landfall and moves inland, additional HF and VHF emergency nets are likely to become active throughout the affected areas. No matter where you are operating, please listen before transmitting and ask if a frequency is in use. This is to avoid unknowingly interfering with stations operating on a net that you might not be able to hear. This leaves hams in a quandary – the traditional FCC view on radios capable of operating outside the amateur bands has been that they're OK for hams to use within the amateur bands and on authorized frequencies outside the ham bands, such as those used for MARS (Military Auxiliary Radio System) operation. This new memo, however, suggests that no one, including hams, may legally use these radios at all, if they are capable of operating outside the ham bands. The ARRL says it is in discussions with FCC enforcement officials to try to clarify the situation. 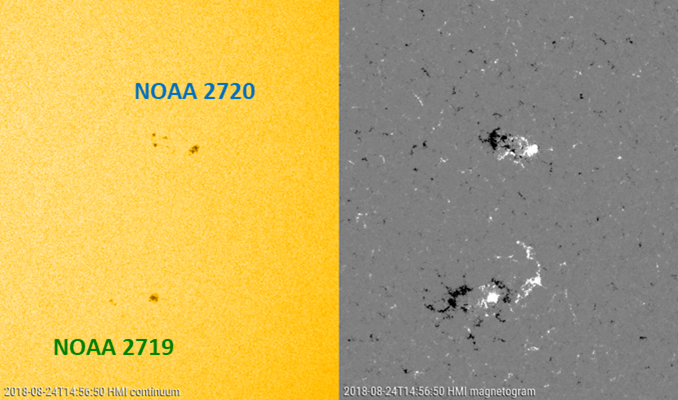 There's been some hopeful excitement among sunspot watchers that a group of sunspots observed in late August with reverse magnetic polarity to most of the solar cycle 24 sunspots might signal the start of cycle 25. However, the ARRL Letter says the Royal Observatory of Belgium's Solar-Terrestrial Centre of Excellence has splashed cold water on that theory (the water vaporized instantly, of course!). reversed. This is sometimes a sign of a new solar cycle. The center noted that while the magnetic polarity of sunspots typically reverses with a change of cycle, spots from a new cycle also need to originate in the mid-solar latitudes, "typically 20° to 40° from the equator." 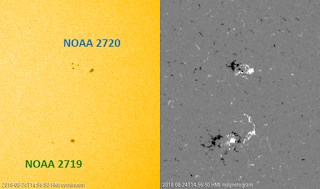 The sunspots in this group were observed at only about 8° solar latitude. The center says every sunspot cycle has several dozen reverse polarity sunspots that are identified with the current cycle despite being magnetically "upside-down."